As expected, the Lightning have officially put goalie Marc Denis on waivers. If he is not claimed in the next 24 hours, he will be re-assigned to Norfolk. Game Recap: TB 2 - MTL 5 - Rock Bottom? So just what is rock bottom? And when you hit it, where do you go from there? The Bolts have now lost eight out of their last ten. They are a league worst 3-13-1 on the road, and sit tied with Washington for last place in the Eastern Conference at 33 points. If this isn't rock bottom, I would hate to see what is. The Bolts started Johan Holmqvist in net last night and promptly yanked him early in the second after he surrendered 3 goals on 11 shots. Then after Ramo had a good showing, but gave up 2, in came Holmqvist again. All I could think was, "here we go again." Let the game of musical goalies begin. The Lightning goals came late in the third after the Bolts were already down 5-0, one from Prospal and one from Hlavac. "We have zip for confidence," Tortorella said "We can't give our problems to someone else. We need to mentally, first of all, start thinking, 'I need to make a difference. I need to regain my confidence here.' Hopefully a few guys start doing that, and maybe a good thing happens." "This is pretty low," St. Louis said. "This is as low as we've hit for a long time. It happens. You don't like it when it happens. You grow from it, and you battle through it. There's no doubt in my mind we'll come out of this." The question is...how? Will there be a trade to "shake things up?" Will we see call ups from Norfolk? Will the guys that are here all show up and play their asses off on the same night? The other question that should be asked is...why? Why is the team playing so poorly? Is it coaching? Do they really not have good enough players? Injuries? Philly comes to town Saturday afternoon, and if that rivalry doesn't motivate the guys, and get things turned around, I'm not sure what will. UPDATE:It appears Denis may be put on waivers today. Rumours are swirling that some team may grab him on reentry (fingers crossed). If and when it happens, I'll let you know! Vinny had 2 goals, Ramo was solid. That's about all the positive I can take out of the game. The defense needs to stop collapsing back and letting guys skate freely in the zone. The blind passes that get picked off and turned into scoring chances need to stop. The intensity and sense of urgency needs to pick up. Asked if his players were frustrated about their recent slide, Tortorella said, "I hope they're frustrated. I'm not so sure they are. I don't know what to tell you. There's a lot of things we need to get better at. We're a (terrible) hockey team right now. "Everybody says 'Don't panic. Don't panic.' There had better be some panic going on within this club to get this turned around, or it's going to spiral to where you have no luck at all." Tortorella did, however, applaud the performance of Ramo, who had several outstanding stops among his 29 saves. "Don't talk to me about the net being off or this and that," Tortorella said. "It could have been 8-2." Hope everyone had a nice holiday! Ramo will be in net for his 3rd consecutive start tonight in Washington. Brad Lukowich is slated to return as well as Craig McDonald. Keep an eye on this team the next few games. If their play and win total doesn't pick up, moves could be made. Granted, with the "pending sale" nothing earthshaking will happen, but some minor adjustments could take place. Once the trade freeze is lifted, there are quite a few players on the roster and in the system that are pending UFA's and RFA's, and that could be trade bait. It wasn't as bad as it sounds, at least not from a goaltending standpoint. 2 of Carolina's gaols were empty netters. Ramo kept the team in this one. For the 2nd straight game the guy looks legit. The rest of the team seemed to already be on Christmas break. St. Louis had the lone goal for the Bolts. Ramo gets his first NHL start and win, and the bolts win for just the 2nd time in 7 games as they beat Toronto 2-1 Thursday night. Ramo had 31 saves on 32 shots,, and the Bolts got goals from Jason Ward and Vinny Lecavalier. "Just to get a win, it definitely feels good," Lecavalier said. I'm not sure what was louder, the cheer for the announcement of Marc Denis being scratched, or the cheer for the introduction of Ramo. It was a great night, there was a buzz in the air, and the kid did not disappoint. He made all the saves he was supposed to, came up with some big stops to keep the Bolts in the game, and the lone goal was a deflection that was just out of his reach. It was a great debut for Ramo, I hope he can do it again Saturday against the Canes. "He obviously gave us a chance to win," Tampa Bay assistant coach Mike Sullivan said. "I thought he made key big saves at some critical times. To have success in this league, you have to get timely saves, and I thought he did that for us." "He made some good saves when we needed it," Ward said. "I think we played well defensively as a unit to help him out. We needed a win, and no matter how we got it, it didn't matter." "We were really desperate for a win," Ramo said. "Everybody was so pumped up to win this game." This statement was just released by the Lightning stating that Palace Sports and Entertainment has entered into an exclusive negotiating agreement to sell the team to Oren Koules and that both sides hope to have an agreement in place by the end of January. The Tampa Bay Lightning have recalled goaltender Karri Ramo and defenseman Jay Leach from the Norfolk Admirals of the American Hockey League, Executive Vice President and General Manager Jay Feaster announced. Leach has been recalled on an emergency basis. Ramo, 21, has appeared in six games with Norfolk this season, recording a 2-4 record with a 3.33 goals-against average and a .898 save percentage. He was sidelined for several weeks with an ankle injury and returned to action on December 1. The 6-foot-2, 201-pound native of Asikkala, Finland, appeared in two games with the Lightning last season, posting a 3.43 goals-against average. Ramo is going to get the start Thursday against Toronto. No word yet who will be scratched between Holmer and Denis. No better time than the present to see what this kid is made of. Also of note, it looks like Ryan Craig's season is officially over. His efforts to rehab the knee injury we futile, and the center underwent surgery Tuesday to repair a torn anterior cruciate ligament and torn meniscus. The estimated recovery period for his is 6 months. The kid just can't catch a break. Gratton is still in the midst of a two week recovery for a hip injury. Should be back at the end of the month. Ouellet is nursing a dislocated shoulder, estimate on that is 6 weeks. No word yet on Lukowich's shoulder injury. This is becoming redundant. The Bolts gave up 6 to Atlanta. Holmqvist was pulled after the 1st, Denis fared no better. The defense struggled again, this game they lost Lukowich to injury. Tortorella shuffled lines like it was going out of style, but to no avail. One bright spot was Jason Ward. He had one of the Lightning goals, shorthanded, and seemed to be one of the few players with some jump in his step. The other Lightning goal came on a redirect from Vinny Prospal. So after this team has dropped 5 of 6, where do you think things are going? What should Feaster do to right the ship? How far should he go? What about Torts, has he worn out his welcome in the Bay? There are a lot of questions surrounding this team, what do you think the answers are? It's that time of year again. Most of us are busy doing our last minute holiday shopping, looking for that gift that's just right. I'm hoping that this year I won't be disappointed. Not by what I get under the tree, but what I get on the ice. See, I've started to get "that old familiar feeling" again. The Lightning are starting to slip, have virtually no identity and seem to need the same thing yet again this year. But I have the feeling that if I set my expectations too high I'm just going to get disappointed. I would love to see Feaster Claus leave a #1 goalie under the tree, a gritty defenseman and a 2nd line sniper in my stocking, but I just don't think it's going to happen. This isn't a year of wants, it's a year of needs, and the needs are many. I seem to remember this time last year, the need was there for a true #1 in net. Granted, the Denis experiment hadn't fully fizzled, but it was close. Perrin and Feds were no where close to filling the shoes of the departed Modin and Stillman. And the defense, well, it was what it was. Now we are sitting in much the same place, currently 3 points out of 8th in the east, and struggling. Feaster Claus has said again this year, buck up guys or I'll shake things up. Again we need goaltending, defense and 2nd line scoring. We'll get to see Darche and Karlsson play with Richards tonight, at the start of the year who would've thunk? Torts know his back is up against it saying "This is the dynamic of our club right now, I'm using all our top players offensively and defensively. We need some other players to step up in certain areas to take some of that. We need people to step up in all areas of the game.'' Sound familiar? With the holiday trade freeze coming tomorrow, don't expect anything soon. 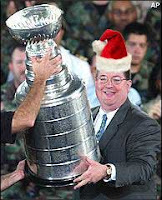 I just hope while everyone out there in Lightning land is enjoying their holiday, Feaster Claus will be hard at work, doing his best to bring the smiles back to the faces of Bolts fans this season. Happy Holidays everyone! Go Bolts! Sorry about taking the easy way out with the AP writeup. (AP) -- Brian Pothier made his presence felt a soon as he got back on the ice for the Washington Capitals. After being scratched for two games, Pothier scored a power-play goal in the third period to give the Caps a 3-2 win over Tampa Bay on Saturday night. "I've been struggling for maybe 10 games and ended up costing the team a jersey," Pothier said. "Obviously, when you score and get a couple of points, it's a huge confidence booster." Thomas Fleischmann and David Steckel added goals, and backup goalie Brent Johnson made 23 saves. "(Johnson is) a winner," Washington interim coach Bruce Boudreau said. "The last two times, anyway. Sometimes he doesn't look pretty making the saves, but we said if he allows two goals or less, we're going to win." Boudreau was happy to see Pothier redeem himself. "He sits out two games -- he competed his rear end off," Boudreau said. "For him to get the goal on the power play is great because you need that secondary power play." 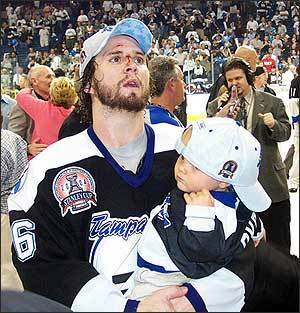 Paul Ranger and Vincent Lecavalier scored for Tampa Bay, and Johan Holmqvist made 29 saves after being pulled from his last two starts. Lecavalier tied the game at two 5:50 into the second with a wrist shot off a backward pass from Vinny Prospal, but Shane O'Brien was called for high-sticking to set up Pothier's goal at 5:06. "We can't continue to take penalties," Tampa Bay coach John Tortorella said. "We're taking too many penalties. (O'Brien's) got to be responsible with that stick. He's had a problem with that all year." Washington took a 2-1 lead 8 seconds into the second period on Steckel's shot after Pothier won the opening faceoff, but Lecavalier tied the game at 2 about six minutes later with a wrist shot off a backward pass from Vinny Prospal. Ranger scored about five minutes into the game, and Fleischmann, whose assist on Pothier's goal gave him his first multipoint game of the season, answered 10 minutes later. The Capitals have won four of their last five games, while the Lightning have lost four of five. C Blair Jones has been recalled from Norfolk of the AHL and is practicing with the team this morning. He’s here because the shoulder injury that took RW Michel Ouellet out of Thursday’s loss to Calgary in the second period will keep him on the sideline for four-six weeks. No word yet on how the 21-year-old Jones will be used. He has six goals and 13 assists in 26 games for the Admirals. We’ll update as information becomes available. No, that's not a typo. There were actually 15 goals scored in this game. Unfortunately, Calgary had more of them, and left the Forum with a win. 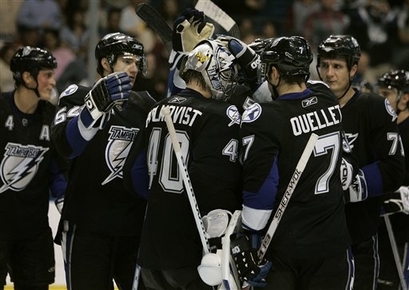 The Bolts surrendered hat tricks to both Kristian Huselius and Jarome Iginla. If you were looking for defense, you were watching the wrong game. Time and again the Bolts defensemen turned over puck in their own zone, and Calgary converted on their opportunities. Johan Holmqvist was chased in the 1st period after giving up the first 4 goals. Marc Denis played well, but in the end turnovers beat the Bolts. The Lightning goals came from Lecavalier, 2 from St. Louis, Prospal, Richards and for the second straight game, Andre Roy. Even with all the turnovers, the Bolts kept playing and tied the game up 4 times. The Lightning had their chances, and had the game tied at 6 late in the third period. But in the end it was Iginla taking over, scoring his second at 14:41 of the 3rd. The goal proved to be the game winner. He followed that just 1 minute later with his 3rd. The final Calgary goal was an empty nettter from Olan Nolan. Not sure what to take away from this one. The defense needs to play much better, as does Holmqvist. Puck control and possession need to improve. This team can obviously score, they just need to figure out how to stop their opponents from doing so. 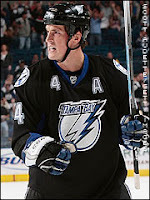 Next up the Bolts the Alex the Great and the Washington Capitals this Saturday at the Forum. Hockey players are indeed tough. After suffering what appeared to be a serious knee injury the night before in Toronto, Brad Richards was back on the ice to face Montreal. The Bolts star center played a fantastic game, assisting on Vinny Lecavalier's goal, and then netting the game winner in the shootout. "I've found that if I go in with speed and doing something quick I have more success, and that's all it is, there's no secret," said Richards, who is 2-for-2 in the shootout this season. "I go in and try to shoot, it's pretty simple. I don't have the hands to do a bunch of dipsy-doodle stuff." 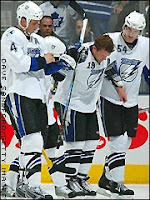 Richards also contributed a huge penalty-killing effort as the Bolts held on through the final 2 minutes of overtime after Vinny Prospal was sent to the box for tripping. The other Lightning goal came from the true tough guy of the Bolts, Andre Roy. It was his second of the season and was a nice shot off a rebound that beat Rookie goalie Carey Price. "That was huge," Roy said. "I was at the end of my shift and I was pretty exhausted but I gave a last push and I was lucky enough that O'Byrne just lost it." Another bright spot for the Bolts was the play of back-up goalie Marc Denis. He got his first win of the season, stopping 28 of 30 shots. "It's huge, especially in the fashion we did it," said Denis "You have to play with an attitude in a shootout." The Bolts now head home to face Calgary on Thursday. Wanted to pass along a couple of other things. I just got off the phone with the lead attorney for Absolute Hockey who was getting ready to get on a plane in New York back to Tampa. If you’ve been following the story, there was a meeting held in New York last night with the league to try to figure out a settlement to make the lawsuit go away. Word is that all sides worked late into the night and have come to an agreement that will make the lawsuit go away. In all liklihood, Oren Koules bought out the Absolute partners which should clear the path for him to try to purchase the team on his own, but we’ll have to see. There will be a statement released later this afternoon and I’m scheduled to speak with the attorney around 5:30 p.m. to figure out the details. The lawsuit that divided the group that was attempting to purchase the Lightning from Palace Sports & Entertainment has been settled with Doug MacLean and Jeff Sherrin getting an undisclosed financial settlement from Holly wood producer Oren Koules. According to a statement released by Koules through the Lightning, he will pursue the team with business partner Mark Berg. A third investor hasn't been named but it is believed to be California banker Russell Belinsky. "I am pleased that the lawsuit will be dismissed and finally resolved, and I am confident that OK Hockey can commence and consummate a transaction with the existing owners to purchase the Tampa Bay Lightning,'' Koules said. Lightning owner Palace Sports & Entertainment said in a statement: "We are happy that Oren Koules, Jeff Sherrin and Doug MacLean were able to reach an amicable resolution this week. In light of the settlement, Palace Sports & Entertainment is expecting a new proposal from one or more of the principles and when received, PS&E will evaluate all its options. Regardless, PS&E will continue to operate the Lightning and the St. Pete Times Forum in the first class manner consistent with its history." To say the road has been unkind to the Lightning would be an understatement. In it's latest debacle, the Bolts lost not only another game, but a key player in Brad Richards. Richards was lost early in the 2nd period when he crashed into the boards while chasing down and battling for a puck with the Leafs Tomas Kaberle. He was down for about 3 minutes, and had to be helped off the ice. The team said the injury doesn't look to be as serious a first thought, and that he may be able to go against Montreal. The second period was one the Bolts would like to immediately forget. After losing Richards, the Bolts surrendered four goals on seven shots in 4 minutes, 32 seconds of the second period that chased Johan Holmqvist. The Lightning continue to be a dfferent team on the road, and now posess a league worst 2-11-1 road record. "Let's call a spade a spade, it was a good old-fashioned ---- kicking," said John Tortorella. "It's very disappointing, not the game we wanted to play," said Lecavalier. "We played well in the first period but after that we couldn't keep the play in their zone." The Bolts head to Montreal for the second game of back to backs in a short Canadian swing. Brad Richards traveled with the team to Montreal, but is not expected to play. What happens when you can't stay out of the box in OT? Inevitably you give up the game winning goal. That's what happened as the Bolts lost in OT to the Islanders Saturday night. The Lightning were called for 10 penalties on the night, the final 2 in overtime, and with 27 seconds left, former Bolt Mike Sillinger got the game winner on a shot from the left circle. "Anytime you get two power plays in overtime, you have to score," Sillinger said. The two Lightning goals came from Brad Richards, both in the third period. "We battled," Richards said. "It was a great effort. We got one point. We would have liked to have two, but we couldn't get that done." Holmer looked good again, giving up a fluky goal and a deflection, neither of which he saw. He finished with 30 saves on 33 shots. I think we played hard, and battled back a couple times," Tampa Bay coach John Tortorella said. "We did a lot of good things." The Bolts now hit the road for 2 games in Canada, first against the Leafs then the Habs. I would like to think it wouldn't take threats from the GM to get a team going, but after Feaster gave the guys an ultimatum, they have responded. The win over Carolina was the Bolts 3rd in a row and 3rd since Feaster threatened to shake thing up. This was probably the most complete game I have seen from the guys in a while. The 1st period and a half, the Bolts completely controlled the pace. The defense was solid, leaving Holmer to only see 5 shots in the first period. But when he was called on, the guy stepped up. He made brilliant saves while the team was on the penalty kill, and even had a little help from his helmet as a Cory Stillman shot ricocheted off it and over the net. The Lightning goals in the game came from guess who...Vinny and Marty, but to say they carried this team in this game would be mistaken. All four lines played very well, Nick Tarnasky had a couple of chances, as did Darche. Roy was throwing his weight around, and O'Brien chipped in with a good fight to start the 2nd period. I liked what I saw last night, and I hope THIS is the team that shows up every night down the stretch and into the playoffs. (AP) -- The Ottawa Senators are in their longest losing streak in over a decade. However, the latest loss has the team feeling a little better about itself. Vinny Prospal scored in the fourth round of a shootout and the Tampa Bay Lightning extended Ottawa's losing streak to seven games with a 4-3 victory Tuesday night. The Lightning blew a 3-1 lead in the final two minutes but won the shootout 2-1. Daniel Alfredsson scored twice during a three-goal third, helping the Senators tie it at 3. Alfredsson (1:57 remaining) and Wade Redden (1:21) completed the comeback scoring 36 seconds apart late in the period. "I think we tried hard all game long, worked it pretty good, tried to create chances," Alfredsson said. "It's obviously very nice to see that we got rewarded. We would have loved to have won it in the shootout, but we're happy with getting a point." The Senators have lost seven consecutive games for the first time since Feb. 22-March 9, 1996. Ottawa has a two-point lead over Carolina for in the Eastern Conference. Mathieu Darche, Chris Gratton and Filip Kuba scored for the Lightning. Tampa Bay has won two consecutive games following a six-game losing skid. "I'm not talking any negatives," Lightning coach John Tortorella said. "We won a big hockey game against a pretty good hockey team. Mistakes were made. They will be addressed." (TSN):Vincent Lecavalier displayed his scoring touch and toughness, and helped the Lightning end a long slide. Lecavalier had two goals and an assist as the Lightning snapped a six-game skid with a 4-1 victory over the Boston Bruins on Saturday night. "It's definitely a confidence-booster," Lecavalier said. "You could feel right from the beginning we played very well." Lecavalier was sporting a large welt on his right cheek after the game, the result of being hit by a tipped puck in the second. "It feels all right," Lecavalier said. "First time I ever got a puck that hard in the face. It doesn't feel too good." Lecavalier's first goal of the game was his 250th in the NHL, coming in his 655th game. He has 16 goals and 39 points in 34 games against Boston. "There's no question he's the best player in the game right now up to this point," Boston centre Marc Savard said. "He's a tough guy to contain when he's skating."